It took moving to California for me to like pizza. Makes no sense, I know, but I just can’t hack the spicy sauce and unctuous bricks of melting mozzarella that characterize a true Chicago pie. Milder cheeses and oven-roasted greens on nutty, toasted flatbread, however, make me happy. This pizza works with whatever toppings you like. Add roasted butternut squash for another colorful Meatless Monday option. Lou Malnati’s it isn’t, but California-style pizza is its own special dish. I took the idea for a skillet pizza from the cover of last month’s Sunset Magazine. You can also use a pizza stone or baking sheet. Add 1 teaspoon oil to a saute pan over medium heat. Add the onions and cook over gentle heat until caramelized, about 10-12 minutes. Add the garlic once the onions have caramelized, stirring occasionally until fragrant and just brown, about 2 minutes. Season to taste with salt and pepper and remove from the heat. While the onion caramelize, fill a large pot with water and bring to a boil over high heat. Add 2 teaspoons salt and the kale, boiling until the kale softens and turns bright green, about 3 minutes. Drain and cool. Heat a large, oven-proof frying pan over medium-low heat. Add 1 tablespoon oil and swirl so that the oil coats the pan. Working on a lightly floured surface, press the dough down with your hands until you’ve formed a 13-inch round. Lay the round into the hot pan (the sides of the dough will come up the sides of the pan). Cook until the bottom is golden brown, about 5 minutes. Flip the dough out onto a plate. Coat the pan with the remaining tablespoon olive oil and return the dough to the pan, golden side up. Be sure to press the dough down into the pan so all the uncooked dough comes into contact with the hot surface. 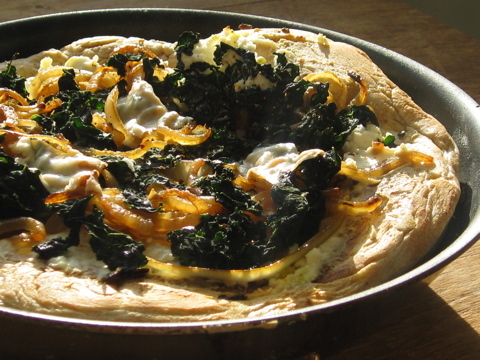 Spread the ricotta over the golden brown surface of the cooked dough, leaving a 1-inch border all around. Sprinkle with caramelized onions and then the kale. Add a sprinkle of sea salt, pepper and red chili flakes to taste. Brush the outer crust with 1 teaspoon olive oil to give it extra sheen and flavor. Bake in pan in oven until crust is crisp and cooked through and the kale has just started to char, about 20 minutes. Cut into wedges and serve immediately.